Introducing our local Community Bakery! One of the exciting things about moving to a new area is exploring the local shops and businesses and I’ll be honest The Man and I are pretty lucky, having moved near to some very lovely shops we are getting a little spoiled. As I harbour the dream that one day food will play more of a central role in my work life too I’m always interested in finding out how other people are making this a reality and support small local producers. When I discovered Blackbird Bread on Twitter, I as keen to find out more about Twickenhams Community Bakery, and not just because of the name! 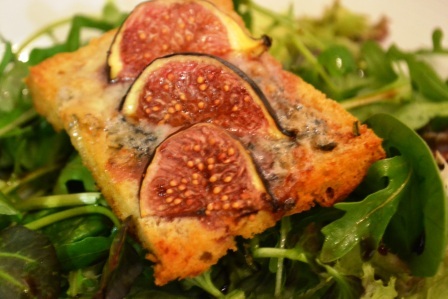 After a flurry of tweets we took delivery of a wonderful foccacia which was eaten to quickly for a decent photograph but does feature here with figs and dolcelatte. 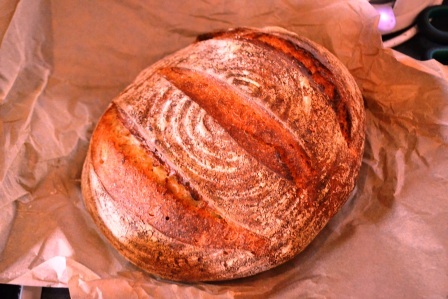 Our next order was a sourdough loaf and a lemon drizzle cake as a treat. I loved the flavour of the sourdough and like the focaccia it kept very well, refreshing nicely even after a few days and I found we were finding more creative ways to use the bread, not letting it go to waste. 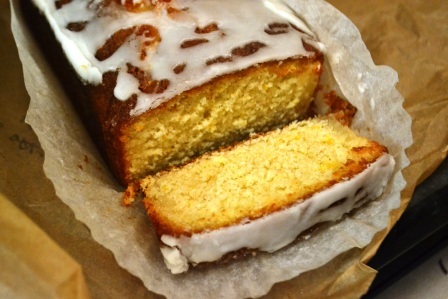 The lemon drizzle was great too and disappeared very quickly! The Blackbird bakes three times a week from his home kitchen and I’m looking forward to trying more of the great range of loaves. You can have your bread delivered in the local area for a small charge but I really enjoyed the slightly covert feeling of picking my loves up from a house on a street not too far away. When a lot a big supermarkets are stocking “artisan” bread and a local bakery can shift loaves without price list seemingly regardless of where they are baked it feels nice supporting someone who is taking a different path; producing a small number of quality loaves for the local area. Sticking it to the big guys one loaf at a time! If you live in Twickenham go and check out Blackbird Bread if not have a look around, the person next door might just be a a community baker…it could even be you! ← The Hungry Sparrow is back!